By a / May 18, 2010 / . Culture jamming comes full circle from the fringes to institutional validation in “Keep It Slick: Infiltrating Capitalism with the Yes Men” the first solo exhibition of the collective’s antics. The show includes props, PowerPoint presentations, and media reports of Andy Bichlbaum and Mike Bonanno’s best-known examples of “identity correction,” their technique of impersonating the officers of corporations in order to expose the executives’ malicious intentions. 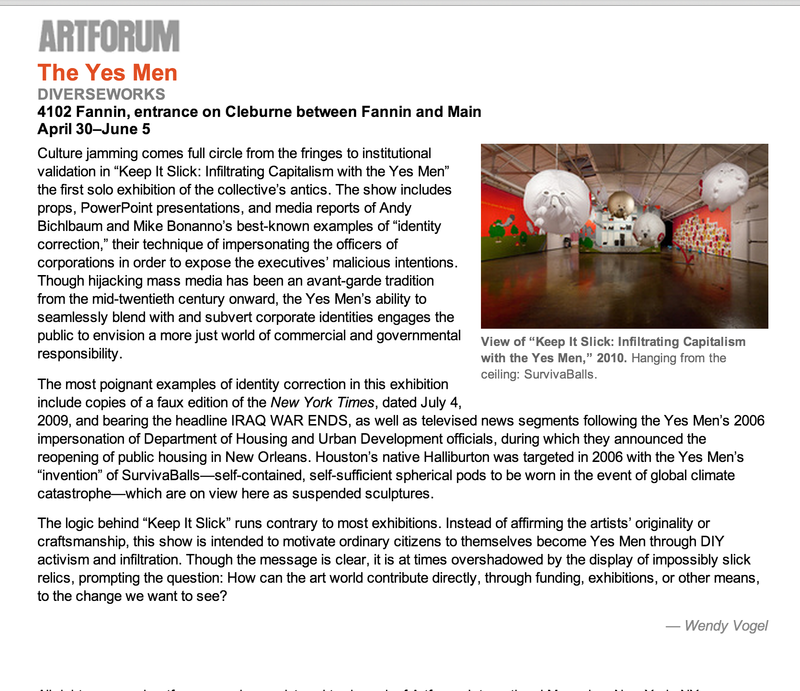 Though hijacking mass media has been an avant-garde tradition from the mid-twentieth century onward, the Yes Men’s ability to seamlessly blend with and subvert corporate identities engages the public to envision a more just world of commercial and governmental responsibility. The most poignant examples of identity correction in this exhibition include copies of a faux edition of the New York Times, dated July 4, 2009, and bearing the headline IRAQ WAR ENDS, as well as televised news segments following the Yes Men’s 2006 impersonation of Department of Housing and Urban Development officials, during which they announced the reopening of public housing in New Orleans. Houston’s native Halliburton was targeted in 2006 with the Yes Men’s “invention” of SurvivaBalls—self-contained, self-sufficient spherical pods to be worn in the event of global climate catastrophe—which are on view here as suspended sculptures. The logic behind “Keep It Slick” runs contrary to most exhibitions. Instead of affirming the artists’ originality or craftsmanship, this show is intended to motivate ordinary citizens to themselves become Yes Men through DIY activism and infiltration.